The interaction between the biosphere and the atmosphere affects all living organisms, including humans. From atmospheric transport and deposition of heavy metals to the effects of ground-level ozone on forested ecosystems, the biosphere and atmosphere are inextricably linked. Much of the research done in LAR can be considered at the interface between the biosphere and the atmosphere. We are involved in quantifying biogenic (natural) emissions of volatile organic compounds (VOCs) (such as isoprene and monoterpenes) from forested areas and studying the impacts of these emissions on local and regional air quality. The exchange of carbon (CO2) between the biosphere and atmosphere, and deposition of nutrients and heavy metals to the plant or ground surface are also important areas of research. 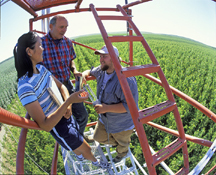 Research in this area involves measurements of the exchange of trace gases using eddy covariance (and other) flux techniques, spectroscopic techniques, and tracer release methods. Satellite data and modeling approaches are also important, such as computational fluid dynamic (CFD) modeling capabilities. Applications of this work include using FLUENT in large eddy simulation (LES) mode to investigate biosphere/atmosphere exchange processes within and above forest canopies. This includes treatment of in-canopy chemistry in one case and simulation of nocturnal drainage flows in a second case. 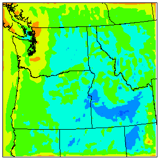 Through EPA support in a Regional Geographical Initiative, we have begun to investigate the spatial and temporal patterns of nitrogen, sulfur, ozone, and mercury deposition within the Pacific Northwest. Our focus is upon using the AIRPACT regional modeling system to simulate pollutant deposition to sensitive ecosystems. We are working with state and federal agencies to compare model results to measurements as a way to evaluate the accuracy of model estimates and to improve deposition modeling methods within the CMAQ modeling framework. The analysis of the stable isotopes of carbon provides a distinct method for investigating biosphere-atmosphere interactions and ecosystem scale carbon cycling dynamics. Because photosynthesis and respiration provides a unique signature in the atmosphere, it is possible to partition the net ecosystem exchange (NEE) into its key components: gross photosynthetic assimilation and ecosystem respiration. To better describe biosphere-atmosphere interactions, high temporal resolution is required to capture all the frequencies contributing to the flux. We are currently employing fast isotopic measurements based on Fourier Transform Infrared (FTIR) Spectroscopy coupled with the disjunct eddy covariance (DEC) flux technique. The FTIR-DEC technique is a novel approach for making real-time direct measurements of total CO2 flux and isotopic CO2 fluxes in a forest ecosystem and can potentially be used for continuous investigation of biosphere/atmosphere interactions. 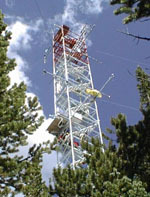 Observations have been made at the Boardman, Oregon field site in summers 2005 and 2006 and have produced 24h/day measurements of CO2 concentration, isotopic del values, and isotopic CO2 fluxes on 34 second centers, all automatically under computer control and from soil level to above the tree canopy heights. LAR has worked with the USDA Forest Service to develop tools for land managers to guide the deployment of artificial pheromone sources used to combat bark beetle infestations in forested lands. This has involved the use of sulfur hexafluoride (SF6) tracer methods to conduct field studies where SF6 is used as a surrogate for a pheromone release, and the dispersion of SF6 within a forest canopy is measured using a variety of tracer sampling and measurement instrumentation. Field programs have been conducted in forests in Montana, Oregon and Louisiana during the past several years. Results from these studies have been used in the development of a simple Lagrangian puff model and to evaluate much more sophisticated computational fluid dynamic (CFD) simulations using the FLUENT CFD package. To measure net ecosystem exchange of carbon, the Department of Energy has developed a network of eddy covariance (EC) flux sites (Ameriflux) where EC measurements of CO2 fluxes are conducted continuously to obtain seasonal and annual estimates of NEE. For sites located in complex terrain, it has become obvious that EC methods do not capture CO2 respiration into nocturnal drainage flows where cool air drains downslope within a forest canopy. We have collaborated with the University of Colorado at the Niwot Ridge Ameriflux site to conduct nighttime SF6 tracer tests to measure the dispersion and transport of gases within nocturnal drainage flows. These tests have been used to develop modeling methods to account for CO2 loss during these drainage conditions. This has included the application of our forest canopy puff model at Niwot Ridge. Even more difficult problems exist at the H.J. Andrews experimental forest site in Oregon where Oregon State University is investigating CO2 fluxes into a steep, V-shaped valley. We are collaborating with OSU to conduct SF6 tracer experiments within the valley to document CO2 flow patterns and to develop methods to account for CO2 budgets within very complex terrain. Field measurements and high resolution meteorological models are currently used to develop surface parameterizations of input parameters for global and regional climate and air quality models. Many of these models predict time-averaged values of velocity, turbulence, and chemical species concentration. However, highly reactive trace gases never react on an average basis. Thus, full physics simulations are required to predict the instantaneous velocity, turbulence, and species concentrations in order to properly account for reactive trace gas chemistry. Large-eddy simulation is an example of a three-dimensional full physics simulation used at LAR to predict these parameters for the air within and above forest canopies. Field measurements of meteorological conditions and chemical species are required in order to evaluate the model before it may be used for within-canopy chemistry simulations of highly reactive trace gases. The final product of this research will be improvements of input parameters used in regional and global air quality and climate models.